The Dannmar D-7X Four Post Lift | Extended version of the D-7 lift. The D-7X lift is ALI and ETL Certified. Here it is! This is the hottest, most popular car lift ever built - PERIOD. Without a doubt, this is the best deal on the market for the home hobbyist that wants an affordable parking and service solution, without sacrificing quality. Are you looking for an economical answerto finding increased parking space? Are you looking for a portable service lift with all the most popular options included in the price? If you answered yes to either of these questions, then you need the Dannmar Commander D-7 economy home / hobbyist four-post lift. 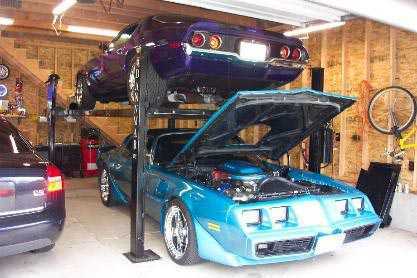 This garage lift is the most popular design on the market. Some people would call this their 8,000 lb. model. We rate it conservatively at 7,000 lbs.This is the most popular lift on the market. And nobody has a better deal on it. The Dannmar D-7X four-post vehicle lift is the extended version of the D-7 lift, with 7,000lbs lifting capacity. Designed to work with a wider variety of vehicles, the D-7/X is a longer, wider and taller version of the standard D-7 model. 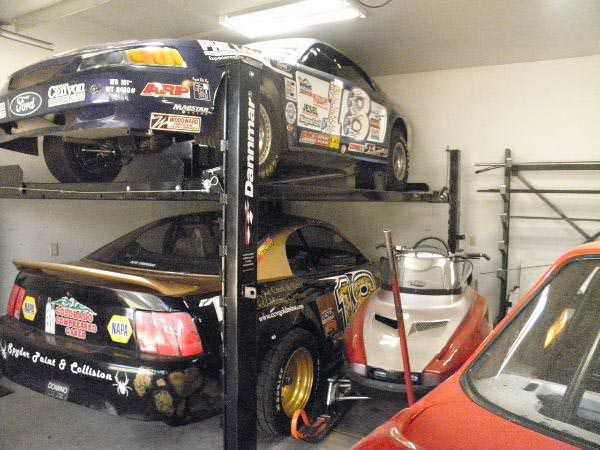 Having that extra room can make all the difference for a car collector or anyone in need of more parking space. The D-7X is perfect for that exact application. It features a single point safety handle and a very durable hydraulic pump assembly. Having extra room can make all the difference for a car collector or anyone in need of more parking space. This lift is perfect for that exact application featuring a single point safety handle and very durable hydraulic pump assembly. No special foundation is required and installation is simple. Optional casters enable you to roll the lift outside or wherever best suits your needs. The space saving lift fits in a typical parking space and has an overall height of less than seven feet to truly maximize valuable floor space. You can also use lift for service work or detailing. Other uses are storage of ATV's, snowmobiles, jet skis, golf carts, boats or anything else that needs to be up off the ground. Great for utilizing the wasted space above your car. If you have the room, purchase the D-7X. It will give a wider range of flexibility with cars and trucks. Minimum Runway Height: 4 -1/2"
"We have Purchased many lifts from ASE, and have been extremely satisfied not only with the quality of the lifts, but also with the service. On top of that, I know I will always get the best deal"
"I currently have the Dannmar D7 I purchased from you about a year ago. I liked the D7 garage lift so much, I would like to deal with you again. In the past year I have recommended you to a number of people in my car clubs, to my neighbors, and my dad even bought one. I currently have a 70 RS/SS 396 Camaro, 1979 pro-touring Trans Am 403, and recently purchased a factory condition original 4 speed 1979 Camaro Z28. My '70 Has appeared in calendars and coloring books, my TA was selected Firebird of the month in April by Trans Am Country, and my 79 Z will join them shortly. Here are the cars I hope to put on 2 of your lifts in my new shop. As you can tell I am an avid collector. I would be making another purchase in Oct/Nov upon completing my shop and 79 Camaro. Thanks again for the great deal." "The lift was delivered and installed today - 8 days after order - pretty darn good service - thank you!! It works great. Did you wanted a picture of it installed? 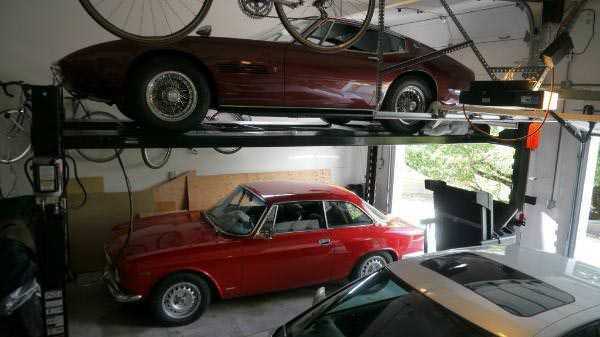 If so here's one - 1969 Maserati on top, 1967 Alfa Romeo below. Thanks again, very happy with the lift".